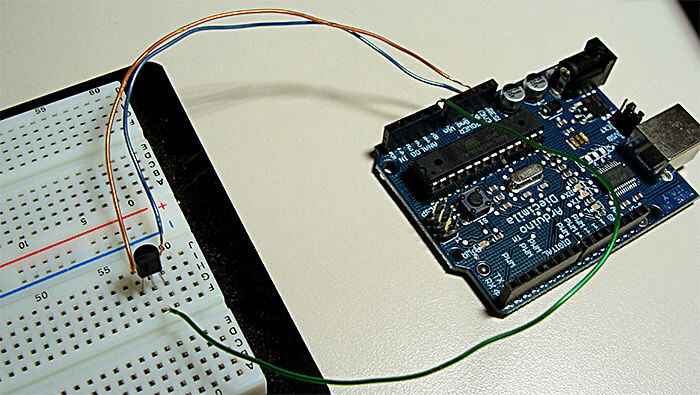 Arduino (You can use other microcontroller, but then you will need to change the code). LM35 Precision Centigrade Temperature Sensor, you can get from any electronic store. Here is the DATA SHEET. This is a quick and simple step. Just connect the 5V output from Arduino to the 1st pin of the sensor, ground the 3rd pin and the 2nd one, you connect to the 0 Analog Input. Here is the Arduino Code, just upload it and check the Serial Communication Option. You can also download the .pde HERE. You rock man… Your website is awesome! I did almost the same thing back in May and posted it to LadyAda’s website. However, mine didn’t have the nice pictures yours has. Nice job. Cool and easy to understand circuit. Well done! Best regards from spain and keep on the good work! Thanks for sharing; it will be helpful to me. I’m working on a similar project. I used Silver’s code, mentioned above, to get me off the ground, but now I have to advance it and your code will help improve my understanding and capability, so thanks again. Currently, I’m on the hunt for code that will display a bar graph in real time of the temperature data. So far, this has been daunting. how many of the sensors can be connected to 1 arduino, and how long can the wires be? thanks, and sorry for the ignorance…. I am also currently working on a similar project. I have the LM35 working and have just received my LCD 16 X 2 screen. Now to solder on the header pins…. How would you alter your code to not only give a readout of the temperature, but also turn something on and off like a small fan? 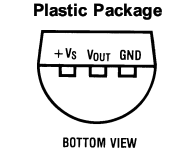 The 5 refers to the 5v supply voltage. The Analog to Digital Converter (ADC) compares a sample voltage to the supply voltage and provides a digital number based on 1024 steps. The formula (Sample Voltage * 1024 / Supply voltage) shows that 2.5volts * 1024 / 5volts would result in a digital number of 512 which is what we would expect for a voltage half the supply voltage. To get the find the sample voltage from a digital number the formula is reversed (Digital number * supply voltage / 1024). So our count of 512 would give (512 * 5volts / 1024) and tell us that there is 2.5volts on the sample pin. However, that doesn’t explain the 100 in his formula. That is there because the LM35 supplies 10 millivolts per degrees Celsius. So, let’s look at an example. The room temperature is 19 Celsius which means the LM35 supplies 190 millivolts, or .190volts. Putting that number into the first formula (.19volts * 1024 / 5volts) means we would expect to see a digital number of 39 on the analog pin. So let’s say we do get a reading of 39, what does the program do with it? I like this! I previously used a Dallas 18B20 sensor, which is far more accurate but works over a one-wire interface, making it tough to program. This seems plenty accurate enough, so I’ll give it a try! Not that it makes much of a difference, but you really don’t require the array samples[i] to perform averaging. A single variable can easily be used to keep a running total, which can be zeroed out after each reading. Can you tell me how you connect the Arduino board to PC? What is the cost of that board? Great tutorial! This makes a very nice and easily put together temperature sensor. Didn’t you use any resistance from 5v to the temp sensor? @Raj Just use a USB cable. It costs around U$34. Since the Arduino default vref is 5V, the analog read from 0 to 1024 represents 0 to 5V. Also.. a delay(200) is quite enough of a delay between sample reads.. the sensor output is constant, so the 8 samples can be accomplished in 1/5 of the time. Just change your main loop delay to a higher value, something of the order of delay(5000). At least here, I noticed a more stable operation. Will my LM35 sensor is faulty? For my reading in celcius have very high values, 99, 104 degrees ? @Brutus great comment, I will take a look at that! Thanks for sharing! Is there a way to make this sensor work for liquids, in particular pond water. what is the max length for a cable between board and sensor. I hope this string has not been abandoned. I want to make a simplistic controller for a solar water heater pump, for a fish pond. It would consist of a solar water heater panel with an air temp sensor LM35 inside panel box. A 120VAC submersible pump, a 3000gal fish pond with a water temp sensor LM35 (waterproofed), and a controller box supplied by 120VAC. 1. If the pond water Temp is below ~75°F, and the Solar Panel Temp is above ~90°F, Turn ON AC to the pump. What do I need to make this controller and program it, I am thinking this is well within the capabilities of the Arduino board. But maybe someone has a better solution. I am a novice but have skills in board assembly but little programming experience. is it possible to save the temperature readings to an SD card or USB flash drive? hey i tried using the same code and the sensor, the only problem i faced it it doesn’t show anything. I am working with arduino decimila 0011 is it anything related to software or the hardware ?? @dharmang After uploading, you must check the serial communication option. have you tried that? This is great! I’m using your code to make an Arduino thermostat. Im going to use it to control the temperature in my Bull Snakes cage. But Im sure it would work great for a Kegerator or various other projects. Heres what Ive come up with so far. hi again but i was thinking if you can guide me out with sending real time data on to web for temperature and humidity !!! through http://www.pachube.com !!! I set up something similar with a LM34 (which reads in degrees F). The device would overheat unless I put a current limiting resistor in series with the LM34. (10K at Vs). I don’t see the resistor on anyone else’s circuit, am I missing something? Would any one have any idea how to modify this to work with an LM135? This can easily be used with an LM335 (135,235). The only modification to the code is to subtract 273.15 from your samples[i]to convert from Kelvin to Celsius. On the hardware side, you only use 2 pins with the LM335. Your reference voltage connects to the center( ) pin through a 2k2 resistor and the negative pin goes to ground, Analog 0 then connects directly to the center pin. That’s the way I have things set up, and it seems to be working well. How to do this with Temprature-Sensor SMT 160-30 ? Any progress on adding the LCD and RTC to this project yet? Im a noob and i will be using this as part of my own learning project. Richard, not yet, right now I am traveling in USA, but this year I will do for sure! Thanks for reading! The ladyada.net link shows the use of a resistor – your circuit doesn’t .. was it an omission or is it not needed? Just to reply to my own question. Without the resistor you will only be measuring temperatures of +2 Deg C to 150 Deg C. If you want to measure the full -55 Deg C to +150 Deg C you need the resistor. can i use zilog? what is the code when i use zilog? You guys are so admirable that you can build a solution like this. I am in the market looking for a temperature sensor which can alert me should the temperature goes out of range. To do this, I want to use SNMP utilities to make query on the temperature and send email alert if it is too high. The SNMP utility will also log data and plot graph. How can we further develop your project to make it SNMP ready? Am I asking for too much? What can be the cause of this false reading ..? I’m using a 328 – would that make a difference? what is your your reference voltage ? 3,3 V or 5 Volts ? and why a resistance ? is the same with 3,3 v then with 5 v ? why don’t use the pin Adjust on the LM335 ? can you show me your code, please ? Sorry for my bad english, I’m french…. you need to use the 5V for the code to work, otherwise the Analog-Digital converter will not work right. Check the datasheet to see how many mV per temp. @Edward, when you connect it as you were saying, just the 2 pins, AREF to center pin through a 2.2k resistor, and ground, grounded, with the output pin between the resistor and the thermistor, are you changing the analogReference in software to anything? I tried (INTERNAL) and still, way off. i don’t get it, im getting readings like this. Any one who knows what the problem can be? @Anders, that’s strange! Check only the analogRead of your AD, to see if it’s working. I’ve been trying to get this working in exactly the same way as you did (also with arduino duemilanova). I’m using the same code and hardware setup. Everything seems to be working just fine, but the temperatures i get are just not right, its giving me 71 degrees celcius when it should be like 20 degrees (room temperature). I’ve tried different LM35’s but they all do the same, what am i overlooking here? any help would be appreciated! I have a tip if you are powering through USB. Since it doesn’t go through the voltage regulator, and USB rarely gives exactly 5v, you need to adjust for the voltage your USB port puts out. Then measure the 5V and GND pins with a volt meter, and put in the actual voltage. In my case it was 4.71. This made my sensor (LM335) quite a bit more accurate. Also. if i put my fingers over the sensor, the temperature goes down, which is kinda good because, a fever of 300 C would be bad. I have a question I’m using a teensy which uses a USB instead of a serial how could I modify the program? Danie, muito bom seu post! Parabéns principalmente pela explicação da fórmula. Confesso que eu entendia mais ou menos essa parte. Agora ficou claro pra mim. This works well via USB, but is all over the place when powered via the mains! (I’m reading the results via Ethernet). Not sure what happened to my comment. If you want to show 22.6 for temp, multiply your constants by 10 and then you can get them out when you report the data. anyone used a 1N4148 diode for temperature sensor? I’m trying to get results but I don’t know how to convert the given voltage. Good post. I put you in RSS now so I can see more from you sometime again. Also prints the temperature to the serial monitor. hw can i interfacw the lm 358 with lm 35 to achive maximum gain??/? 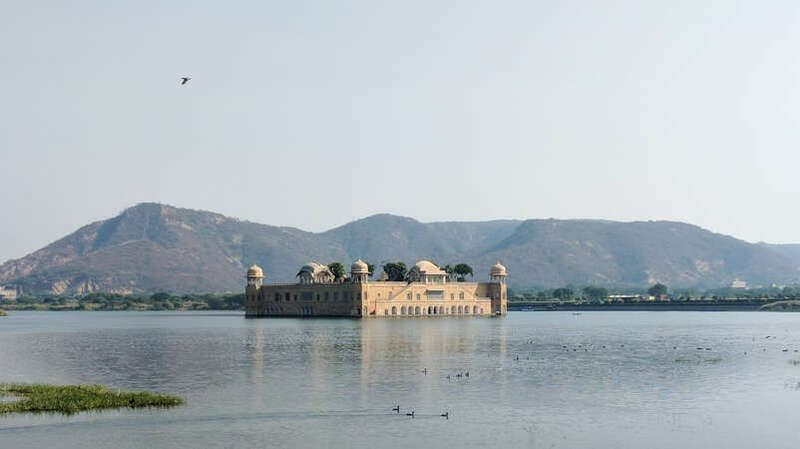 ?/ just plz.. rpl.. as soon aa possible…….thank you……. This code is great and simple for people like me just beginning with Arduino..
Could anyone tell me how to get also decimal values of temperature? If I want to get 26.7 degrees or even better 26.78 degrees which part of the code do I have to modify? and how?.. That is not possible with this IC as it doesn’t have the required precision. You will be able to out put values to 2 decimal places but they will be incorrect you require a more accurate sensor. If you find one that is fairly cheap please let me know as I am also interested. Actually I’m using a LM35CAZ that is quite precise but I paid one sensor 10 euro. That’s ok for me ’cause I’m using it in a research project so I’ve a bit of money to spend on it..
Opa, sei que você é brasileiro né ? Então, eu estou trabalhando em um projeto que tem 1 sensor, um dallas 18B20. eu tentei usar esse código que vc utilizou e ele me retorna uma leitura 0°C,32F,0K … o que está totalmente equivocado.Tem alguma noção do pq ele não está lendo corretamente ? Da uma olhada no datasheet do sensor, e ajusta os cálculos que deve funcionar! What is the maximum distance between the temperature sensor and arduino can be? Hi can this temperature sensor work on ATmega328? Hi, thanks for doing this – very neat! I am a beginner at using the Arduino Uno, and I hope you can help me with something that I am having trouble with. I used some of your code for a LM335 temperature sensor that I am using. I have made a buffer circuit to convert the 10mV/K into a degrees celsius circuit. The circuit outputs for 0 degrees and 100 degrees is 2.73V and 3.73V respectively; but I am having problems getting the arduino to display the temperature. Could you look at my code at tell me if I did something wrong? Where should my voltage from my circuit go into the Arduino (A0 pin?) Can you help me? i have tried other options + i have changed lm35 and tested it again but its the same. I got the same problem as yours, have you figure out the solution? could you please share it with me? Thanks. i was wondering if i could use this type of sensor to measure a water temperature, because i am using an arduino to control the water flood of a jaccuzi. heya..can anyone plz tell me dat can i use GH 311 ultrasonic tranciever module for temperature measurement?? earlier i used TS 601 and it worked quite well. can anyone tell me the coding..!!! Hi. Please forgive my ignorance. OK. In the ADC section of page 263 of the instruction manual of the ATmega 328P it speaks of a Temperature sensor. Do they mean internal temperature sensor? Or is it a special channel reserved to connect a Temperature sensor? I am building a Temperature data logger using an LM35DZ sensor. Is there a need to connect the temperature sensor to a dual op-amp LM358, to amplify the signal and detect very small temperature variations? Or is it that the Freeduino v 1.22 with the ATmega 328P will be able to detect the very small variations in Temperature? If so, how? Is it because of a fast sampling rate of the microcontroller ADC that the small variations will be able to be picked up? I see you have connected the sensor directly to the Freeduino. What range of input DC voltage can I connect to the Freeduino v1.22? Because I can’t afford to fry my Freeduino. 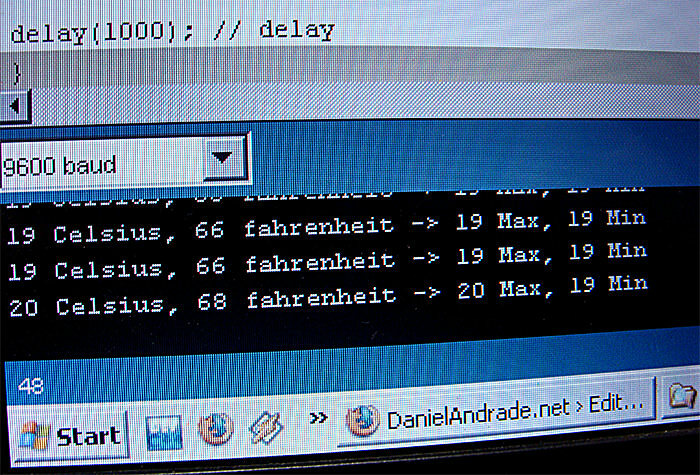 I reviewed your code that you have posted on your site (http://www.danielandrade.net/2008/07/05/temperature-sensor-arduino/). I am generating a code that is similar to yours. My only question is, how would I go about storing data every 5 minutes, for 12 hours? I will appreciate it if you can get back to me at your earliest convenience. Just a heads up – if you cut and paste code from the comments here to the Arduino V1.0 IDE, and it was posted with a non-US-English keyboard, and you are using a US-English keyboard, you will get strange errors when you try to compile. Errors like ” stray ‘\’ in program” or “expected `)’ before ‘u00d701′”. These seem to be caused by differences in the code pages. Some of these are caused by the ” character specifically in Serial.print(“something”); lines. Delete the ” and retype it. I suspect some ( or ) were causing problems but couldn’t verify. Can’t speak for any other keyboard combinations. Just something to watch for if you’re getting strange compile errors. I am already using the Arduino (Uno) to pilot  servos, is it possible to upload your sketch on the same device and have both servo controls (via USB) and temperature being fed back to the computer for treatment at the same time? Many thanks if you’re able to answer. Hello Gilbert, what you could do is first make the program read the temperature, then try to join them together, doing this way I think you will be able to make it with no problem. I was taking a look at the code, maybe you could also add a CASE that reads the temperature and sends to the computer. On SI the word “Centigrade” doesn’t exists ! When they use the correct terminology ? I feel the same way. I really do not understand why people call it centigrade. Celsius is the correct term. As far as the original post goes, I wonder if it is possible to use floating point to get more precise measurements? With a 10 bit ADC, it should be accurate to atleast 0.5*C.
sir what kind of arduino did you use? I’m making a project with an sht15-sensor. Do you know how to program it if i want an alarm for example if temperature is over 20oC (68 F)? I have tried but can’t get the function correct. Please help. i want program of temperature sensor pt100 with arduino freeduino atmega 328..
That line takes a sample reading(given in ohms(we are reading from a thermistor)) and converts it to a temperature, then adds it to an array called samples to be averaged in the next step. Hello ! I don’t know if somebody will answer me but I try ! Do you think it is possible to use an Arduino Nano for this system ? Yes yon can! 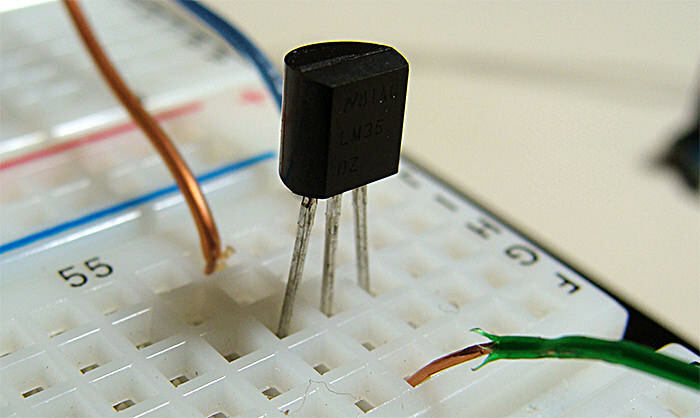 You can use any arduino or microcontroller with an ADC port. Please help me in program to ATmega328 connected with LCD 16*2 dispaly and LM35 sensor.